Its almost as if Barack Obama is trying to pick a fight. At the very least it is one of the most arrogant moves ever made by this arrogant administration. Tom Donilon, who holds the position as National Security Adviser to President Obama has resigned (for family reasons) and Obama has chosen Susan Rice, the Ambassador to the UN as his replacement a position that does not require Senate confirmation. triggered by protests over an anti-Islam film, an explanation which has proven to be inaccurate. The hows and whys the real story wasn’t given is still under investigation. The ambassador had earlier been considered in the running for the Secretary of State post but withdrew from consideration amid the continuing fallout over her role following the Benghazi attack and the fear that she would not be confirmed in the Senate. Susan Rice served as President Clinton’s Assistant Secretary of State for African Affairs. According to a 2004 report published in Newsmax, Rice may deserves a hefty portion of blame for the fact that Osama bin Laden wasn’t neutralized during the 1990s. “The FBI, in 1996 and 1997, had their efforts to look at terrorism data and deal with the bin Laden issue overruled every single time by the State Department, by Susan Rice and her cronies, who were hell-bent on destroying the Sudan,” one-time Clinton diplomatic troubleshooter Mansoor Ijaz told radio host Sean Hannity in 2002. According to Richard Miniter who wrote the book “Losing bin Laden,” Rice played a key role in scuttling the deal that could have prevented the 9/11 attacks on New York and Washington. Miniter claimed Sudan was anxious to turn bin Laden over to the U.S., Rice – then a member of Clinton’s National Security Council – questioned Khartoum’s credibility. Miniter said that Carney argued the Clinton White House should accept their offer of bin Laden and see if the National Islamic Front actually hands him over. In a 2002 Washington Post op-ed piece co-authored with Ijaz, former ambassador Carney described Susan Rice as a major obstacle to accepting offers from Sudan to share intelligence on bin Laden’s terrorist network. Overturning a months-long interagency process undermined U.S.
Kenya and Tanzania were bombed six weeks later. 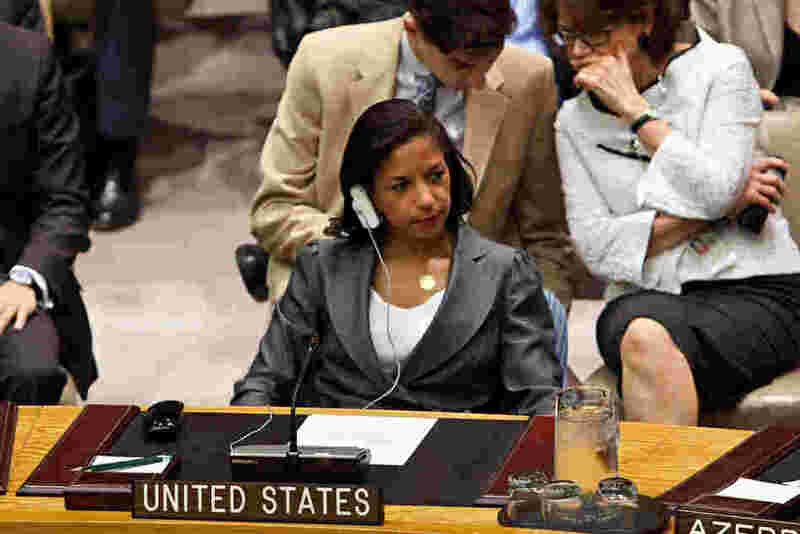 Even if one wants to grant Susan Rice a pass on the Benghazi talking points believing she didn’t know she was lying, the Ambassador’s torpedoing of America’s counter-terrorism operation under Bill Clinton should be enough to prevent her from the National Security Adviser post. But it wont because this position does not need to be confirmed by the Senate and this administration is too arrogant to care.